Amino acids refer to organic compounds which contain amino and carboxyl groups. They are the building blocks of proteins which play a crucial role in the biological processes of a body. They are found in abundance in red meat, sea food, eggs, dairy products, quinoa and soy products. Amino acids are beneficial for strengthening immune system, improving muscles, fighting arthritis and cancer, and treating tinnitus and rectal diseases. According to this research’s latest report, titled “Amino Acids Market: Global Industry Trends, Share, Size, Growth, Opportunity and Forecast 2018-2023”, the global amino acids market reached a volume of 8.5 Million Tons in 2017. Rising health-consciousness among the consumers has increased the demand for nutrient-rich food products. This has prompted the manufacturers to introduce protein-rich foods and beverages in the market, leading to an increase in the demand for amino acids. Apart from this, amino acids are used for the manufacturing of supplements which are consumed by athletes as well as the aged population. Further, amino acids are also used in animal feed to supplement the protein requirement of the animals. According to the report, the market is expected to reach a volume of 11 Million Tons in 2023, registering a CAGR of 4.8%. The report has segmented the market on the basis of type, covering glutamic acid, lysine and methionine. Glutamic acids represent the leading type within this segment. Based on raw materials, plant-based amino acids dominate the market. On the basis of application, the animal feed industry leads the market, followed by food and healthcare industry. Region-wise, the report covers Asia-Pacific, Europe, North America, Latin America and the Middle East. Currently, Asia-Pacific represents the largest region, accounting for the majority of the total global share. The Unites States is the leading importer whereas China is the largest exporter of amino acids. The report has also analysed the competitive landscape of the market with some of the key global players being Amino, Ajinomoto, Cargill, Archer Daniels Midland and CJ CHeilJedang. This report provides a deep insight into the global amino acids industry covering all its essential aspects. This ranges from macro overview of the market to micro details of the industry performance, recent trends, key market drivers and challenges, SWOT analysis, Porter’s five forces analysis, value chain analysis, etc. 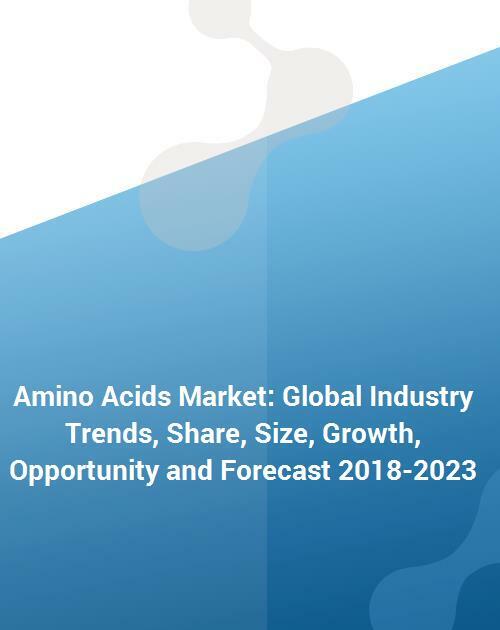 This report is a must-read for entrepreneurs, investors, researchers, consultants, business strategists, and all those who have any kind of stake or are planning to foray into the amino acids industry in any manner. How has the global amino acids market performed so far and how will it perform in the coming years? What are the key regions in the global amino acids market? What are the key application segments in the global amino acids market? Which are the popular product types in the global amino acids market? What are the various stages in the value chain of the global amino acids market? What are the key driving factors and challenges in the global amino acids market? What is the structure of the global amino acids market and who are the key players? What is the degree of competition in the global amino acids market? How are amino acids manufactured? What are the price trends of amino acids? What are the import and export trends of amino acids?